We enter the year 2014 with breathless optimism. The headlines are an endless stream of euphoria shouting for higher U.S. stock prices, bond prices and real estate prices in the United States. Is this a great time to buy stocks? Writing this on December 24, 2013 it is still unclear. Investors may experience a 1998 to 2000 rush in stock prices which leaves rational market observers like myself continuing to look foolish on the sidelines. Or they could revert back to where the fair (not cheap) value range has been over hundreds of years. Jeremy Grantham put this target somewhere around 1100 on the S&P. The S&P sits at 1829 as of this writing. Last week we looked at what market analysts were saying about stocks during previous market peaks in December 1999 and December 2007 and found that they are saying the exact same thing they are today. This was an interesting experiment but we should take it one step further and look at what they were saying during the market bottom, in March 2009, which was an excellent time to purchase stocks. Before getting started we'll review the four big reasons you hear today for further U.S. stock gains in 2014 and beyond. 1. Market Momentum - Prices have had an excellent 3 year run and even a less optimistic scenario should have prices rising at least 10% based on momentum. 2. Price To Earnings - Projected earnings show that the market is cheap. Why? Because Wall Street projects staggering earnings growth in 2014. 3. Sentiment Toward The Market - We hear today that markets are climbing a wall of worry. In reality, most sentiment readings reached record high bullish levels throughout 2013. 4. Blue Chip Stock Safety, Dividend Payments & Stock Buybacks - Blue chips stocks are on fire, dividend payments are rising and companies are buying back their own stock. We will see now that when stocks were bottoming in March 2009, which was an excellent time to purchase U.S. stocks, these same four arguments were used by professionals to explain why stocks would move lower. When you reach the bottoming process of markets, participants project forward from the trajectory they are currently on based on momentum. Notice the chart included in the article below which shows earnings estimates continuing to plunge downward at the current trend. The opposite occurs today where wild high earnings estimates show projections blasting upward to new highs across the board. The Wall Street Journal: "DOW 5000? There's A Case For It"
Looking solely at valuations, namely price relative to earnings estimates, the S&P at 500 isn't necessarily a wild stretch. According to Goldman's data, the bottom of the 1974 bear market had a forward P/E of 11.3. At the trough in 1982, it was 8.5. Put a multiple of 10 with estimates of $40 to $50 a share and the S&P comes out at 400 and 500. You can see from the article below that earnings estimate projections are a serious problem when earnings are falling, but in today's world (December 2013) there is no discussion of this problem because stocks are rising. You can feel the despair back in 2009 that stocks will never find a bottom and the situation is almost hopeless, the exact opposite of the feeling of "no ceiling" around stock prices today. Writers in 2009 would then say that markets found previous bottoms at P/E ratios below 10, which is the reason why markets should fall much further. The market back in March 2009 appeared over valued because it had not reached the historical bottom during bear markets. Today, with the P/E ratio at 25 there is no discussion of over valuation. The Wall Street Journal: "To P/E or Not to P/E? That Isn't The Appropriate Question"
The current market climate has drawn comparisons to the mid-1970s, when investors dreaded coming into work, knowing the markets were in for a rough time. With that kind of despair ruling the market, "what's the difference between 12 times or eight times or 10 times earnings? There isn't demand for equities, because people can't see any signs of recovery soon," says Peter Boockvar, equity market strategist at Miller Tabak. He contrasted this with the late 1990s, when "expensive got more expensive." The problem, according to investors, is that S&P 500 earnings expectations are constantly changing, as analysts reduce their expectations for per-share earnings. As of a few weeks ago, analysts anticipated per-share operating earnings to come in around $69 in 2009, according to Thomson Reuters, but that figure (already reduced from some kind of previously ridiculous estimate) has come down in the last few weeks, and now the expectation is for earnings of about $50 to $55 a share for the year. Using a typical valuation at the market's nadir -- a price-to-earnings ratio of anywhere from eight to 12 times earnings -- that puts the S&P 500, optimistically, at 660. It only broke through 700 Monday. So even a more optimistic outlook still suggests more pain. Market strategists, until recently, were quick to dismiss the consensus, knowing it was too high -- but now they are concerned that even the reduced revisions mightn't capture the depth of the economic decline. "The risk is to the downside if the economy substantially worsens from the levels we currently see," says Fred Dickson, director of private client research at D.A. Davidson. "It's a downward moving target at the moment, and the valuation metric has just been very tough to put one's finger on." Trader's Narrative: "S&P 500 Price Earnings Ratio (Long Term Chart)"
In any case, the data for February and March 2009 are an estimate only and take us down to 12 - which is without an argument a very low P/E Ratio. But not as low as we've seen the price earnings ratio go. In August 1982, the PE Ratio dropped below 7. And in both July 1932 and July 1921 it went below 6. To see that scenario again, the S&P 500 would have to drop another 40-50% to the 430-360 level (assuming earnings miraculously stay the same). The only time that the PE Ratio has dropped as precipitously as in this bear market was in the aftermath of the 1929 bull market top. 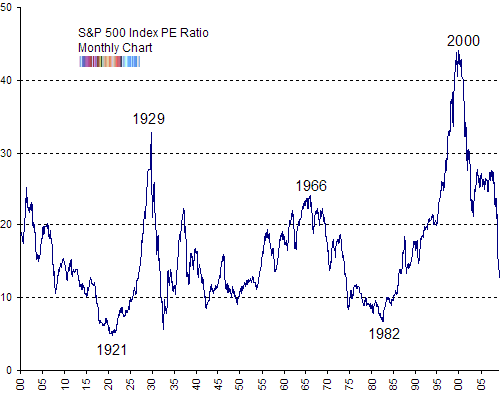 At its zenith in 1929, the PE Ratio was only approaching 33 while in the 2000 market top it reached 44. New York Times: "Stocks Finally Looking Affordable"
Over all, there is pretty direct correlation between the p-e ratio and future long-term returns. For example, when the ratio has been 15 to 20, stocks have risen only about 50 percent over the next decade. When the ratio has been above 25, stocks haven’t risen much at all. So does this mean stocks are finished falling? No. In the other two great bear markets of the past century, in the 1930s and the 1980s, the p-e ratio ultimately dropped to about 6 or 7. To get to that level now, the S&P 500 would have to drop below 400, from the current 701, and the Dow Jones industrial average would need to be below 4,000. So stocks may well continue to fall. They may even still fall a fair amount. Almost all sentiment readings were touching extreme lows in early March 2009. The daily sentiment index reached 2% the week stocks bottomed. That means 98% of investors polled felt stocks were going lower. Contrast that with two 93% readings over the past few weeks where only 7% of investors thought it was possible that stocks could fall in the short term. Horan Capital Advisors: "Bearish Sentiment Hits Highest Level Since 1990"
The Economist: "Despair Springs Eternal"
So that reflects the extent of investors' fears at the moment. Either we are indeed facing another depression, in which the falls in economic output are cumulatively 10-20%, rather than 3-4%. Or central banks will only be able to get us out of a recession by inducing the kind of inflation that devastated portfolios in the 1970s. If you can take a 10-year view, this seems like a good time to bet against that pessimism. The problem is that investors are more worried about the next six months, and the danger that stocks could get significantly cheaper in the short term. Any outlook on the markets for the year ahead tells you that even if the overall market gets in trouble, investors will be protected in blue chip stocks. These companies have stable long term dividends, strong balance sheets and exposure to overseas markets putting a floor under any price declines. What was the discussion like back in March 2009, which was a great time to purchase blue chip stocks? Investors were dumping them across the board as they watched many stocks cut their dividends and see earnings drop due to their exposure to overseas markets. Another big market proponent you hear today is that companies are buying back their own shares with excess capital. This occurs at the top of markets. At the bottom companies are trying to raise capital, slash costs and preserve cash. The Economist: "Slash and Burn"
Meanwhile, a new fear haunts the markets: the mounting number of firms slashing their dividends. That banks and insurance companies will chop their payments is now understood, but the pain has spread. General Electric (GE) has cut its dividend for the first time in 71 years, Dow Chemical for the first time since 1912. In Europe previously reliable payers like Telecom Italia and Anglo-American, a mining firm, have reduced their payouts, and even BP has said it cannot increase its dividend at today's oil prices. Furthermore, the share of American earnings paid out as dividends has declined from a post-war peak of almost two-thirds to about one-third in 2007, with many firms preferring stock buybacks (which have now ground to a halt). The Washington Post: "Corporate America's Icons Crumbling Under Global Recession"
"The big surprise is that large companies that we thought were well-capitalized with abundant access to credit and that could access the global market, none of that is helping them," said Ed Yardeni, president of Yardeni Research, an investment research firm. "But a lot of these issues that we thought of as positive are turning back to bite them hard." Analysts point to two key reasons why some of the nation's largest companies have unraveled in the current downturn. One is that they had come to rely on providing financing to their customers, lending money for sales of their own products. When the credit markets ground to a halt in mid-September, it set off chain reaction of pain, hurting consumers and manufacturers alike. The second is their exposure to global markets. Once regarded as a way to spread risks, the diversification exacerbated a drop in sales as foreign countries grapple with more severe downturns. "The reality is that size doesn't seem to matter much," Yardeni said. During March 2009 everyone hated stocks. Everyone discussed how far P/E multiples would fall, how far earnings would fall and how low stocks would ultimately end up. This is an environment to put long term investment capital to work. Today the exact opposite environment exists. I expect stocks to finish the 2014 year lower than where they stand today. Flashback to December 2007: What Was The Outlook For U.S. Stocks?